The European Space Agency has released incredible satellite imagery showing a cavernous crack traveling up an Antarctic ice shelf, leaving the frozen block on the brink of a major split. A large chunk of the Larsen C shelf, which is more than 80 times the size of Manhattan, is threatening to calve into the ocean. The unprecedented splintering of the 10,000-year-old ice shelf could form an iceberg about 5,000 sq km (1,930 sq miles) in size and drastically change the landscape around the Weddell Sea. A compilation of images from the European Space Agency (ESA) Copernica Sentinel-1 satellites reveal how part of Larsen C is hanging by a thread after a 175km (109 mile) crack opened up on its western side. Since the start of the year, the fissure has increased by a further 20km along the 350m-thick ice shelf. According to the ESA, the exact time the ice sheet will break away is difficult to predict. However, the space agency says that when it happens, it may form the largest iceberg on record. Earlier this month Project Midas, a UK research group studying global warming effects in the area, said the breach would massively change the region. 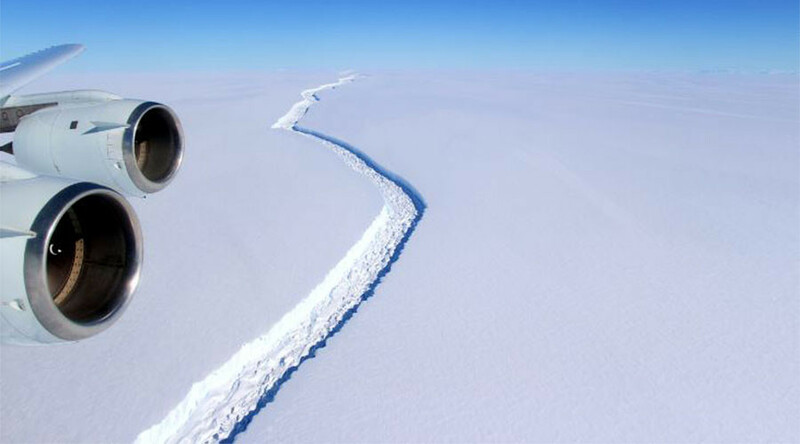 “When it calves, the Larsen C Ice Shelf will lose more than 10% of its area...this event will fundamentally change the landscape of the Antarctic Peninsula,” a Project Midas statement read. The group has also produced a map detailing how far the crack has travelled around 100km since 2010. 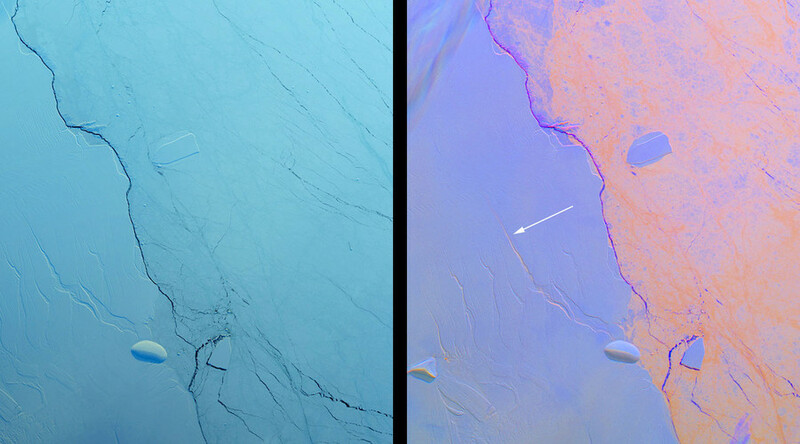 In August last year, NASA published multispectral satellite imagery depicting several fractures in the ice shelf. One composite photograph revealed the contrast between smooth ice pack and cracking in the Antarctic region.